Sapphira Cakes: NEW!! WEDDING CAKES - TRADITIONAL OR CONTEMPORARY? Home made Kuih Melayu, Delicacies and Wedding Cake. NEW!! WEDDING CAKES - TRADITIONAL OR CONTEMPORARY? For weddings, the cake is as symbolic as the nuptuals and ultimately becomes the main focal point of the reception. 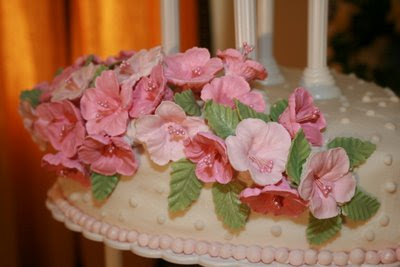 It will form a centrepiece for the wedding reception and surprise and delight your guests. Sapphira Cakes also specializes in individually designed Wedding cakes. 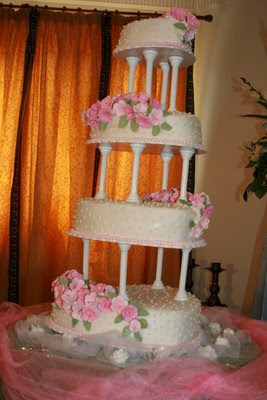 Each wedding cake is designed and inspired to reflect your personality and is decorated to your personal specifications. Each order is individually priced based upon its size and level of design detail. Please contact us to arrange a consultation and discuss your order requirements. Four Tiered Wedding Cake. Photo Courtesy of Brunei Weddings. Wedding Cake finished with a delicate hand made sugercraft flowers. Photo Courtesy of Brunei Weddings. She is self taught and developed her basic skills in making Kuih and Sugar Craft by studying books and going to professional courses. Her early work was tested out on family and friends as a hobby and she quickly began to receive commissions. We are located at ..
.Unit 3. Bangunan Seri Anigma. Kiulap . Brunei Darussalam . To place an order, please call +673 8 984848. If you call, but couldn't ge through please do leave her a message, as she may be in the middle of producing a very tricky bit of sugar work or layering her never ending lapis! Please order as early as possible to avoid disappointment. SAPPHIRA CAKE HOUSE COMING SOON! WELCOME TO SAPPHIRA CAKES ..